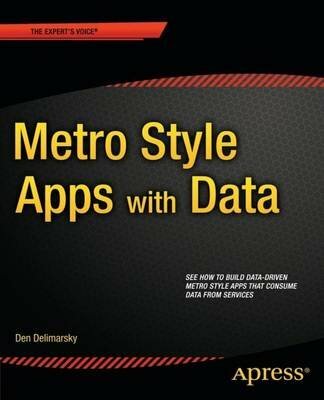 Metro Style Apps with Data is a book that outlines the best practices and recommendations for building Metro applications that consume and interact with various forms of data, including XML and JSON content managed through various web services, as well as content resulting from communication with SQL Server and SQL Azure. Discover how to build applications that work with both on-premises and cloud services seamlessly.Focusing on the code-behind, Metro Style Apps with Data provides a good introduction to the new core elements of the WinRT framework that facilitate data access, as well as a set of re-usable code fragments that can be integrated in production applications. Introduces you to the basics of data access via WinRT Explains the limitations you will have to be aware of when working with data in Metro applications Compares the performance of various data access and storage layers Explains the process of consuming service-oriented data from both on-premise and cloud services What you'll learn The core concepts of data handling mechanisms in WinRT How to serialize, deserialize and manipulate XML and JSON data generated by and outside the Metro application How to connect your Metro application to SQL Azure and other cloud services How to access REST and WCF services from a WinRT application Handling data received via push services Perform data exchange between the WinRT application and node.js How to handle local data storage for Metro applications Who this book is for Metro Style Apps with Data is for developers who have prior experience developing .NET applications and want to apply their knowledge in creating WinRT applications that operate with XML, JSON or any other data format. Experience working with the WinRT framework is not required. This book is a great desktop reference for developers who want to quickly prototype and test their data layer.